Today's burger adventure saw the Fellows venture down to God's Country - South-Western Victoria - to sample the burger treats at Kermond's Hamburgers. 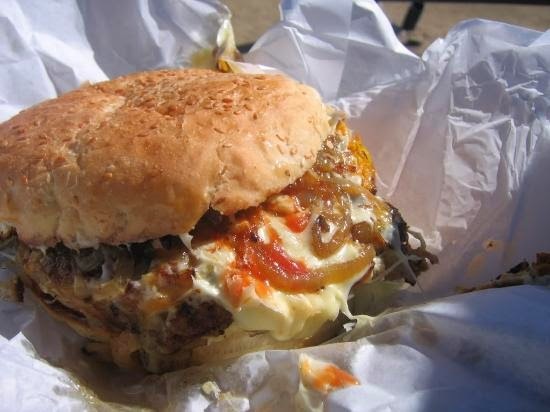 A local institution, Kermond's has been operating since 1949 and specialises in an honest-to-goodness fish and chip shop style burger which has served as the savior of many an inebriated man. Kermond's is your typical country fast food establishment with its retro coke memorabilia and large selection of spiders and thick shakes to choose from (how good are spiders?!). But we were here to sample the burger so we promptly ordered the burger with the lot with extra cheese and got ready to nosh. The burger came out in a flash and was piping hot - in a Burger Friday first, we actually had to let this burger cool a bit before tucking into it. But I am happy to cop the second degree burns to my mouth, lips and feet (I was wearing thongs and some of the juice squirted down onto my feet when I took the first bite - I was a tad unlucky to burn myself there I thought) to know that the burger was not sitting on a bench for 15 minutes getting cold and wilted prior to delivery. Let's break the burger down into its parts. The patty was thinner than a lot of the burgers we have tried in the past but it was tender, juicy and cooked well. Kermond's employ a technique used by fish and chip shop owners for generations which is to fry some brown onion into the patty during the cooking process. The sweetness of the caramelised onion shards complemented the bitterness of the charred burger patty for an opening partnership which would rival Davey Warner and Bucky Rogers - despite being on opposite ends of the flavour spectrum, somehow it just works. The toppings were plentiful and all played their part. The bacon was crisp, the egg was creamy and cooked to a point where the yolk still maintained its glorious ooze, and the Aussie slice of beetroot provided a hint of acidity and tang which cut through the richness of the other ingredients. I have never understood what is so quintessentially Australian about putting beetroot on a burger. The only people that harp on about beetroot on a burger being Australian seems to be the McDonald's advertising team when they reintroduce the McOz burger every six months despite it still being on the menu the entire time. Anyways. To be honest I imagine that not all burger enthusiasts would enjoy this burger for what it is - which is the holy grail of late night pissed food - as there were a couple of minor drawbacks that are not everyone's cup of tea. The first being the structural integrity. As the patty and the toppings were so plentiful, the bun was not big enough to contain everything meaning that the paper bag that the burger was served in was required to do the heavy lifting from a structural integrity stand point. The second gripe is the aftertaste associated with the chips. I am not sure if it is the type of oil that the chips were fried in but they had an unusual after taste (which was not dissimilar to the flavour of the animal fat on a steak or chop that has not been properly rendered). A good squeeze of Heinz Big Red was required to mask this after taste. Overall, the Kermond's burger is a glorious mess of comfort food made from quality country ingredients and ripping value at $18.50 with chips (I am convinced that inflation is a principle that has only been applied to Metropolitan areas). As such, we are naming this burger after another South-Western Victorian icon in Jonathan Brown. A brut of a man that is made from all the right stuff (JB's old man Brian played league footy for Fitzroy) who all 17 other AFL clubs would love to have on their list. Not to mention Jonathan Brown's known love of a beer - a Kermond's and tinny would be a match made in heaven. If you are in the area and are looking for a good burger, look no further than Kermond's. But if you are looking for more of a foodies getaway, head down the coast to Timboon for some of the finest produce in the district. Our chef is a protege of Iron Chef Sakai. He ran 2 of Chef Sakai's restaurants in Japan.